The last article in this series marked the end of the basic section of this ASP.NET tutorial. Over the last four articles, I've attempted to give you a gentle introduction to C# and ASP.NET. I've shown you the basic components of an ASP.NET program; explained how to define simple variables; illustrated how to control the flow of your program through "if" and "switch" conditional expressions; and demonstrated how to run a particular set of statements repeatedly with "while" and "for" loops. Now that you know the basic control structures available in C# - variables, conditionals and loops - it's time to move into murkier territory. In addition to the simple variables discussed previously, C# also comes with a whole set of more complex variables that build on the simple variables you've encountered earlier to allow more complex data storage and manipulation. Over the course of this article, I'm going to give you a crash course in one of the more interesting and useful ones, arrays, and show you how you can use them to make your code jump through ever more interesting loops. Onwards and upwards, then! 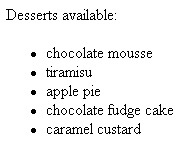 Here, "desserts" is an array variable, which contains the values "chocolate mousse", "tiramisu", "apple pie", "chocolate fudge cake", and "caramel custard". It is thus clear that array variables are particularly useful for grouping related values together - names, dates, phone numbers of ex-girlfriends et al. The definition shown above is a shorthand method to define an array. The proper syntax to define an array in C# is shown below. Defining an array variable in C# is a multi-step process, as compared to languages like PHP and Perl; you need to first declare the variable and its type, and then actually create the array. essentially, the array variable name followed by the index number enclosed within square braces. Notice that the first element of the array is referred to by index number 0 instead of 1; geeks refer to this as "zero-based indexing". C# would fail with an ugly type conversion error message. As explained on the previous page, an array makes it possible to store a group of logically-related values - in this case, a list of mouth-watering desserts. However, there's more to a meal than just the desserts; the desserts are usually preceded by the starters and the main courses (more than one if the cook is a culinary enthusiast). Is there a way to do this in C#? Sure, with a multi-dimensional array. Here the index is made up two values - the first represents the row and the second represents the column. If you look closely, you'll see that the first row stores the starters, the second stores the main course dishes and the last contains the desserts. Note the use of two values in the index to access the element: the first value represents the "row" and the second represents the "column". As usual, I start the script by defining some variables - two integers to store the number of rows and columns for the two-dimensional array, followed by the arrays themselves. The first array, "courses", stores the names of the three courses, while the second, "meals", actually stores the values for each. Next, I have the most crucial part of the code: the two "for" loops used to iterate through the "meals" array. This deserves closer attention. As you can see, the first "for" loop iterates through the rows of the array, with the variable "i" keeping track of the first dimension. Within this outer loop is another "for" loop, used to access each column of the array using the variable "j". Combined, these two loops make it possible to access each and every element of the two-dimensional array, by iterating across the length and breadth of the array. Here is a simple example for the "foreach" loop. Here are my lucky numbers: <asp:label id="output" runat="server" />. This is what you should see in our browser. Here, I've first defined an array of integers called "lucky_numbers", to store a set of numbers. Next, I've used the "foreach" loop to iterate over the loop and print each element of the array. Each time the loop runs, it stores the current element of the array in the "lucky_number" instance variable. Once the loop runs out of its elements to process, it automatically exits and control passes to the line following it. As you can see, the "foreach" loop does not give me as much control over the array, as compared to the two "for" loops demonstrated in the earlier example. However, using an array with three or more dimensions leads to complex programming logic, and code that is difficult to write, read and debug; it should therefore be avoided as far as possible. will always hold 9 values, with each row holding an equal number of columns (3). Of course, it is possible that some of these 9 elements might not be assigned any value; in this case, they will hold the default value defined by C# for the data type of that array. Since a jagged array itself contains other arrays, it is not surprisingly often referred to as an "array of arrays". The script starts with the definition of the jagged array. Note the manner in which I have assigned values to the various elements. A comparison with previous examples will illustrate the difference between this syntax, and that used for "regular" multi-dimensional arrays. Once again, I have used two "for" loops to iterate over the array. Note my usage of the "Length" property to find the number of elements at each level; this ensures that the script does not attempt to access an element that does not exist. In order to use the enumeration, you need to define a variable of that type and assign it a value, as below. Try as you might, C# will not allow you to assign a other value other than those listed in the enumeration to the variable "myBirthMonth". The next example demonstrates the use of the "Months" enumeration in a simple C# script. and here's what it looks like when it's not. In this example, I've used a "Summer" enumeration to create a set of values representing the four summer months of the year. Typically, each value in an "enum" is associated with an integer. By default, the compiler will automatically assign an integer value, starting with 0 for the first value. But this does not really suit my purposes on two counts: first, there is no such thing as a 0th month and second, I need the month to be assigned a number corresponding to its correct position in the calendar. Therefore, I have explicitly defined integer values for each month. Next, the current month (an integer value, by default) is obtained from the system, and cast into the "Summer" enum data type. Finally, the IsDefined() method of the "Enum" object is used to check if the value assigned to the "current_month" variable exists in the definition for the "Summer" enumeration. Don't worry too much about this, I'll be discussing objects and methods a little later on in this series. For the moment, all you need to know is that the IsDefined() method returns true if the value exists in the enumeration, and false if it does not; the output will change accordingly. And that's about it for today. I started this article with an introduction to arrays, a complex variable type that allows developers to store multiple values in a single variable. This was followed by a quick rundown on how to initialize and manipulate them. As part of your introduction to arrays, I also showed you how to define, access and use multi-dimensional and jagged arrays, and iterate over them with the special "foreach" loop. Finally, I wrapped things up with a brief look at enumerations, which make it possible to restrict variable values to a predefined set. In the next segment of this article, I will explain the concept of functions - a block of statements that can be grouped together as a named entity.Functions make it possible to group your code into logical, reusable blocks, and can save you a fair amount of repetitive typing - as well as offering a more efficient way of structuring your C# programs. Make sure you come back for that! This article was first published on 12 Sep 2003.